I've noticed that everyone has a temporary tattoo collection. 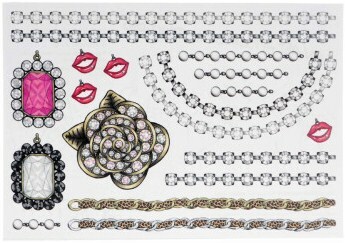 Earlier this year Chanel accessorized their models with transfer tattoos which retailed at $78.00. 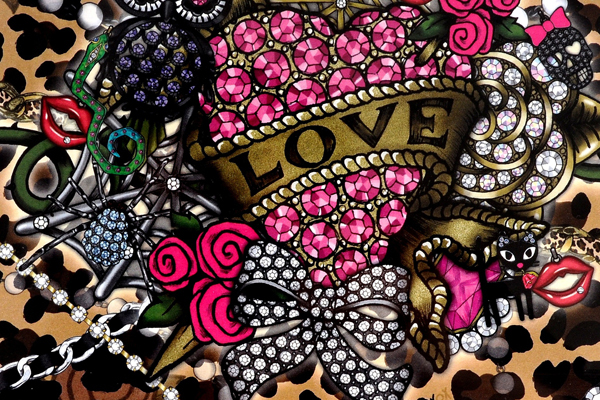 Beyoncé's House of Deréon and Betsey Johnson has joined the trend. This is the way to go if you want the "look" without the commitment. Beyoncé Knowles and Tina Knowles and their licensing arm, Beyond Productions LLC, are teaming up with airbrush makeup firm Temptu to create a limited edition collection of temporary tattoos under the Deréon label. “With a Sixties-pinup-girl meets-futuristic-biker-chick theme, Beyoncé and I really wanted to give our Deréon fall 2010 campaign a tough edginess,” said Tina Knowles, Deréon’s founder, creative director and designer. “We decided to invite Temptu to help us create custom body art for her to model with our fashions. The resulting images were so strong that we realized consumers might want to re-create the tattoos themselves.” The tattoos are due on Nov. 1, and are available in both deluxe and basic packages. Designs include Deréon’s signature fleur icon, rocker bolts and chains, jewel baubles and spider designs. All are waterproof and designed to last for two to five days. 10 tattoo application pads and one of three kit designs, each featuring a different image of Beyoncé, shot for the fall/winter Deréon ad campaign. The deluxe edition includes everything in the basic kit, as well as a signed photo of Beyoncé and a chance to win a trip to New York for a photo shoot. The basic kits retail for $16 and will be available at Sephora stores in the U.S. and Canada, sephora.com, temptu.com and dereon.com. The deluxe edition, $34 and limited to 500 pieces, will be available only on temptu.com and dereon.com. A waiting list is being taken at dereon.temptu.com. Industry sources estimate the line could do upward of $200,000 at wholesale. 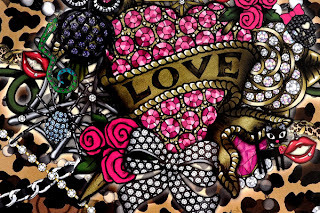 Betsey Johnson presented her temporary skin art collection called Iconic Charms Tattoos. This collection retails at $25 for 96 tattoos. Not a bad price if you likes. You can purchase them here.